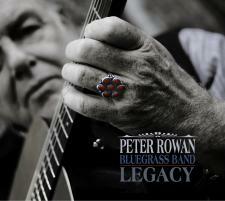 Today marks the release of Peter Rowan Bluegrass Band’s new record titled Legacy (COM 4543). Legacy is a satisfying ramble through 13 tracks of mellow retro-trad newgrass, most of them written and sung by Peter himself. His merry band of veteran pickers is composed of Jody Stecher on mandolin, Keith Little on banjo, Paul Knight on bass fiddle, and of course Peter on guitar. These guys have direct links to Bill Monroe—Peter did a stint in his band, years ago—and stellar guests include Del McCoury, Ricky Skaggs, Gillian Welch & David Rawlings and Tim O’Brien. Woah! On mando, Jody Stecher channels Monroe’s rough-and-ready chops like there’s no tomorrow. For an inside look at the making of this record from a band member’s perspective, check out this interview on Mandolin Cafe HERE. For a limited time, you can download a free song (Jailer Jailer) from Compass Records HERE. Nice! Preview two tracks below. The Family Demon is a straight-ahead bluegrass story that addresses domestic violence and abuse, while Don’t Ask Me Why invokes classic grass-inflected Dead. Sweet, dude. Love to listen and watch banjo bluegrass music and musician playing ! nice music! Thanks for this article.